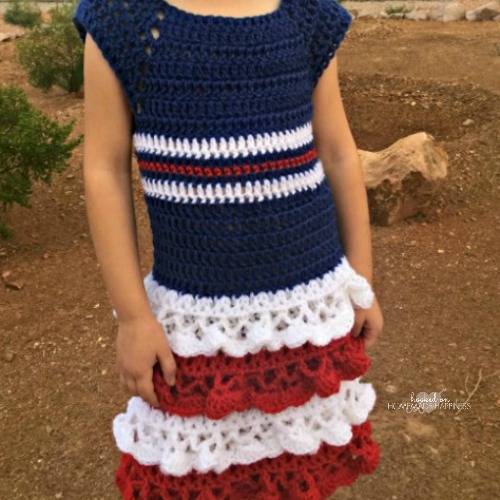 I made this Red, White & Blue Dress to celebrate the summer holidays. 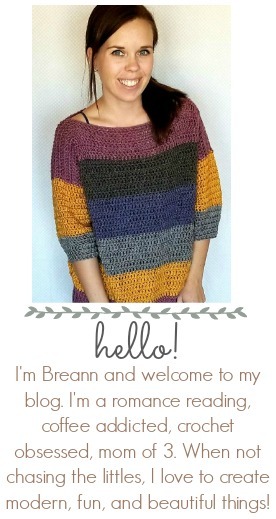 But I might make another one in oranges and yellows! Any color combo would be adorable, really. The finished product measures approximately 21 inches long and 11 inches across under the arm. It fits my 7 year old, but has some stretch and could definitely fit larger. Next you’ll work the ruffles on top of the bottom stripes of the dress. Follow this pattern for each ruffle, alternating red and white and starting at the top of each color stripe. Sew your three buttons along the opening in the back (I sewed them on the end of rows 2, 4, and 6). I used the space between the dc’s on the opposite side as button holes. And you’re done! I hope you love this adorable dress. I love the buttons on the back! I love this dress! I love the ruffles! Since it’s red, white, and blue, you should stop by and check out the Celebrate the USA Link Party I’m cohosting with several other bloggers. I hope you’ll stop by and link up this lovely dress and anything else you’ve created that’s red, white, and blue! Brilliant idea to use pom pom trim for the skirt, I love that stitch, and great seeing it put to use in such a creative way. Thanks for sharing on craft schooling Sunday ,great to meet you! I love this dress. The back is unexpected, it’s a nice contrast to the front. Thanks for sharing on Sunday’s Best. U am going to make this for a little girl at church and embellish it with Holly for a Christmas dress. How many skeins dies it take?